Did you know there are over 2,700 rules governing your Social Security benefits? 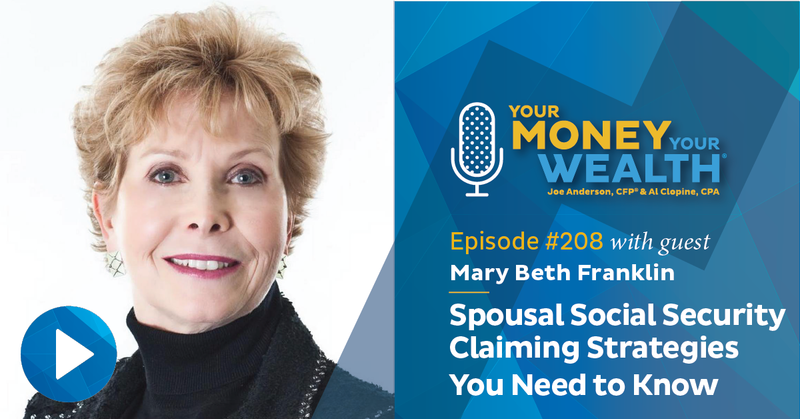 Mary Beth Franklin (InvestmentNews contributing editor and “The Goddess of Social Security”) goes deep on spousal Social Security claiming strategies after Joe, Big Al and Andi tackle a coupleSocial Security disability and spousal benefits questions on their own. Mary Beth caps off the discussion with an explanation of the Windfall Elimination Provision (WEP) and Government Pension Offset (GPO). (13:30) Mary Beth Franklin: Who Can Still File and Suspend Social Security Benefits? Did you know there are over 2,700 rules governing Social Security benefits? I’m producer Andi Last, and today on Your Money, Your Wealth®, Joe, Big Al and I are going to tackle a couple of those rules: will you lose half of your benefits if your “better half” claims spousal benefits? How do “drawing” Social Security disability and file and suspend work, if at all? Then we’ll bring in the Goddess of Social Security, Investment News Contributing Editor Mary Beth Franklin to check our work. She’ll explain why you should scrub the old and busted “file and suspend” from your vocabulary and get to know the new hotness, filing a restricted claim for spousal benefits. And for you public sector and government employees, she’ll also talk about the WEP and GPO. But first, with a spousal Social Security question from Tom in San Diego, here are the hosts of Your Money, Your Wealth®, Joe Anderson, CFP® and Big Al Clopine, CPA. :51 – Will I Lose Half of My Social Security If My Spouse Claims Half? Joe: “My wife turns 62 in February of this year, 2019.” Tom turns 70 in July. “I have been drawing Social Security since 62, as it was necessary. We were wiped out in the housing crash of 2017-ish. Al: I think it means 2007-ish. Yeah. Joe: “So no savings or other income. My wife could take her Social Security at about $700 per month, or I hear she could apply for half my $1900 that I receive. Question: Do I lose half my Social Security if she claims half? Given the scenario above should she take her SSI? Thank you.” OK. Tom, a few different things. Let me answer I guess the biggest one that he’s afraid of, is that Tom’s collecting $2,000 a month. So there’s something that’s called a spousal benefit. The spousal benefit is half of Tom’s benefit – or hers, whichever is higher. Since her benefit is $700 a month, his is $2,000 a month, her spousal benefit is going to be $1,000 a month. So he’s asking the question if she takes the spousal benefit, is that going to reduce his benefit? The answer is no. Joe: Yeah, so Tom, don’t worry about that, if she claims half yours, it’s not like you lose half and she takes half. You’d just be stuck in the same position so no one would ever do that, you would just claim your own benefit. So no, you’re good there. Nothing’s going to happen to your overall benefit. But she is 62. So if she takes her benefit at 62, she is not going to receive half of the benefit. She’s going to receive a lower amount because she’s taking it at 62. She has to wait until her full retirement age to get half of the benefit. So if she takes it at 62, how it basically works is that she’ll take her benefit, which would be a reduced benefit. If her benefit at 66, full retirement age, is $700, she would receive 75% of that. And that would be roughly $600? Al: Yeah 5-something, call it $600, not quite as much. Joe: So her benefit is $600 but the spousal benefit is $1,000, but not until she reaches age 66. So you’ve got a problem here. So it’s looking at what happens with the spousal benefit? It’s called “deemed.” So she might still get the spousal benefit because they’re gonna do a calculation. They’re gonna take her benefit, they’re gonna reduce it by 25% and say, “here’s what your benefit is.” Now if you look to claim the spousal benefit, they’re going to shore up her benefit and add a spousal benefit on top of it – but she’s not going to get the full half of the benefit. It’s going to be reduced because she’s taking it at 62. Al: Well yeah but that’s her benefit. Joe: No I’m saying her benefit is going to be reduced, her benefit would be let’s say $600. Shore up her benefit of spousal, because she’s not going to get 50% of it, it’s going to be 33% of it. So you take 33% of $2,000. I’m just doing the math in my head, it’s probably – it’s close. So her benefit is roughly going to be $700. It doesn’t make any sense to take it early with this math – unless you need the money. Al: Yes. Right. So the simple answer is yes, you can take it, but you’ll have a reduced benefit for life. Joe: Yes. So she can take the benefit. That’s not going to affect yours, Tom, whatsoever. So if you need the money, take it, just know that it’s not going to be half of your benefit. She needs to wait until her full retirement age to get half your benefit. If she takes it at 62, it’s going to be a reduced benefit, and if you’re fine with that reduction of benefit and that helps pay the bills, I guess our advice is to do that. Joe: We’ve got Will from New York. He writes, “I feel I have researched this topic well enough but I want clarification on a few remaining points. I am writing to you after seeing your YouTube video. I wish to take Social Security after I turn my full retirement age of 66 in July of 2019. My wife will turn 66 in June of 2019. She is currently on Social Security disability. Her disability will convert to retirement benefits automatically in the system unless she says otherwise. My intent was for her to, number one, withdraw, not suspend, her draw at her full retirement age. Take a spousal benefit against my work earnings history, and then restart her own draw again at age 70 with enhanced benefits. It seems this option is no longer available. Is this true? Number two. Her draw-” I don’t know why he’s calling it a draw. Andi: Isn’t that sometimes it’s referred to, as you’re “drawing” Social Security? Joe: No. My definition of a draw is like if you’re a salesperson. Then they give you a draw and you have to exceed that draw with commissions. “Her draw is in excess of 50% of my amount if she were to take a spousal benefit. But the difference is small. Is any supplemental draw available to her concurrently once she continues her draw amount after her full retirement age? Or is there no chance at all as her excess spousal amount would be zero? I am angry and dismayed that not only has file and suspend been made unavailable but also it seems, my wife’s option to withdraw and take a spousal draw while her deferred credits grow until 70.” All right. That’s a mouthful, Will. So he wants to take the benefit at her full retirement age. Andi: He wants her to draw at her full retirement age, right? Joe: Jeez, now I feel like I’m in the wild west. Come on, draw. Joe: Yeah, jeez. All right. “Take a spousal benefit against my work history and then restart her own draw again at age 70.” No. So you’re right, Will. She can no longer do that. That was file and suspend, and what that means is this: if you are taking your retirement benefit – so he said he’s going to take his full retirement benefit at age 66 in July, his wife turns 66 in June. She will not be able to take the spousal benefit, first of all, until Will claims his own benefit in July. So let’s just set the record straight there. She could take her own benefit at age 66 in June, which would be a month before the spousal benefit. So she could take her own benefit and then convert to the spousal benefit once he collects, as long as she takes her benefit at full retirement age. Andi: Now you take into account the fact that she is currently on disability, and that that’s automatically going to convert unless she says otherwise? What is he referring to there? Joe: Oh that’s a good question. I forgot about that – she is on Social Security disability. So if she wanted to claim the spousal benefit and get off of her own benefit, she would be able to do that, but it wouldn’t make any sense. She won’t be able to do that until he claims until July, and then she would already be full retirement age anyway because her full retirement age is in June. Right. So she’s on Social Security disability until her age 66. Then at that point, it’s going to turn into her own retirement benefit. Then a month goes by, July, and if the spousal benefit is going to be higher than her own benefit, what happens is that they shore up her benefit with the spousal – for instance, let’s say Will’s benefit is $2,000 a month. Her spousal benefit would be $1,000 a month. That’s half of his, that’s would be a spousal benefit. Andi: But that doesn’t happen automatically. She would have to actually now apply for the spousal benefit, correct? Joe: Not necessarily, because the benefits are called “deemed.” And before you could pick and choose – and that’s what he’s all pissed off about, he’s like, “OK well no, let’s just file the spousal benefit, let her benefit continue to grow.” But now that’s no longer. So it’s either, he’s going to collect his benefit and then when he collects his benefit, what’s going to happen is that they’ll look at what her benefit is, and let’s say her benefit is $990. The spousal benefit is $1,000. Andi: So she’s going to get bumped up to $10 more? Joe: Her spousal benefit is $10 is really how they calculate that. Andi: So they both claim at full retirement age. She gets bumped up when he reaches 66 and they’re all good. So they’re on autopilot basically. Andi: …to grow to age 70. Joe: …by that 8% delayed retirement credit per year. That’s not an option anymore. And so the option is that her benefit is going to turn into the spousal benefit – well, her benefit plus the spousal benefit, once he claims – or you can just wait till age 70. Andi: All right now let me ask you this. She’s on Social Security disability right now. What if she did want to wait until age 70. Is there anything she can do there? Joe: She’s on disability. It’s going to convert to her retirement benefit. She would have to suspend the benefit to get the 8% delayed retirement credit because she’s already getting the benefit. Andi: So she can’t do that? Joe: I believe no. I’m not 100% sure there. But you can’t say, “hey, I’m on disability coverage, even though I’m at full retirement age, and then just count this as disability. And then when I turn 70 now I want my regular retirement benefit with that increased benefit.” It doesn’t work that way, no. Sorry, Will, I wish I had better news, but if you were a little bit older. So here’s the good news, is that if you were older Will, you would’ve been able to qualify for that, but – I don’t know. Andi: Why is that good news? Joe: Well I mean, the good news is that he’s younger now. He’s got just that many more years to live and be vibrant and have fun and enjoy life. Instead of – if you were able to qualify for that, you’d probably be I think, I don’t know, 68 years of age right now. Andi: Yeah, because the file and suspend went away when, 2014, 16? Joe: Yeah. I think it’s 2015, to be honest with you, but it grandfathered people in. If they were at full retirement age of blah blah blah. I think still people qualify for it but you have to be, I think, what’s the year. I don’t have that in front of me. But if you’re about 68 years of age you still qualify. But he does not. Stick around, the Goddess of Social Security, Mary Beth Franklin, is about to give us the exact numbers on that. In the meantime, this week on the Your Money, Your Wealth® TV show, Joe and Big Al teach you how to skip playing Retirement Roulette. This jam-packed half-hour will show you how to avoid leaving your retirement to chance: how to put a cash flow plan in place, improve your distribution rate, control risk in your portfolio, manage market volatility and much more. Check it out free and on demand, online at YourMoneyYourWealth.com – and be sure to subscribe to watch brand new episodes every Sunday, like the episode on Social Security Secrets – watch it in the show notes for this podcast at YourMoneyYourWealth.com. Now let’s bring in the Goddess of Social Security, who knows all the Social Security Secrets – InvestmentNews Contributing Editor, Mary Beth Franklin. 13:30 – Mary Beth Franklin: Who Can Still File and Suspend Social Security Benefits? Joe: Well let’s start. I have a lot of questions for you. You are the world’s expert on Social Security, so I thought what better than to ask the Goddess. MBF: Well with my peer group I just turned 64. I’m a very popular person, let me tell you that. Joe: I got a question from a client, actually yesterday. What happened was he filed for a spousal benefit – so there was a file and suspend situation. He filed for a spousal benefit and let his benefit continue to grow. And then now he wants to put his benefit back on because now he’s 70. MBF: Interesting that you should say that. I just wrote a column about this very subject of the fact that people are becoming aware that the best way to maximize their Social Security benefits is to wait up until age 70 because they earn an extra 8% per year between their full retirement age of 66 and 70. That means if you wait till 70, you get an extra 32% in Social Security benefits for the rest of your life. But the big question is, OK, how do I get that benefit at 70? Do I have to file? And the answer is, like so many other things in Social Security, it depends. For example, your client, what he did was, after his wife had claimed her Social Security benefit, he was able to file what they call a restricted claim for spousal benefits. That means, don’t pay me might benefit, pay me a spousal benefit, which is worth half of what my wife’s getting. But the catch is, only people who were born on or before January 1st, 1954 have that option when they turn 66. He was one of the lucky ones. He filed a restricted claim got half of his wife’s benefit. His question is, what do I do to get my own? Because he’s been filing on his wife’s benefit, he has not claimed his own. So when he gets to 70, he actually has to file for his own benefit. And the only way he can do that is to go in person to a Social Security office to file for his benefit. Joe: So he cannot do it online? MBF: No. Because once you’re collecting a Social Security benefit, which in his case is as a spouse, now you are ineligible to file for benefits online. Now he actually has to go in in person to Social Security office to file for his own benefit. Joe: Oh he’s not going to like that, Mary Beth. MBF: (laughs) But you know what you can do. You can either call the 800 number, which is (800) 772-1213 or go online to SSA.gov to set up an appointment to go into his local office. So he doesn’t have to just go in cold turkey, he can set up an appointment in advance. Joe: How about the opposite? So let’s say that I filed for my benefit, and then I suspended the benefit. So I never collected, and then my wife collected on my benefit. So now at my age 70, I’m going to turn mine on – on even though I never claimed, I just filed and suspended. Do I have to do the same thing because I failed but I never did receive anything, I would still have to go into the Social Security office? MBF: No you don’t. It’s the opposite situation because you technically filed for your benefit on your own record, but you didn’t receive anything because you actually suspended the benefit. That way you triggered a benefit for your wife. But because you filed on your own record, it will automatically start at 70. Joe: Oh, it would automatically start? MBF: Right, because you have filed on your own record and suspended up until age 70. If you do nothing between the time you filed and 70, it will automatically start. Joe: So I would just all of a sudden get a paycheck. How about if they don’t know.. will they send me a paycheck, or when I filed and suspended that benefit, did I already maybe give them a routing number to my checking account? MBF: You gave them all that information and then the only way they pay benefits these days to new beneficiaries is direct deposit. Andi: So that’d be like a birthday present. Joe: All right. So there are clients I’d better get a hold of because they might go to the Social Security Administration office for no reason. Joe: Speaking of spousal benefits, can you help explain exactly how that thing is calculated? Because it’s actually two benefits. It’s your own record plus they shore you up or they add the spousal benefit on top of it. And sometimes it gets a little confusing if they claim their spousal benefit early, or if they wait until full retirement age. Actually, there are really two different benefits and one gets reduced and maybe one doesn’t. Can you talk on that? MBF: Yes. Most people these days, you know, when Social Security was created in 1935, there were very few women in the workforce. It was really designed for a breadwinner family with the husband working, wife staying at home taking care of the kids. And the whole idea was when the husband stopped working and got his retirement benefit because the family income was reduced, then someone who was married to that worker would be entitled to a spousal benefit. And if all things were equal, and you never worked a day in your life, and your husband collected a Social Security benefit, and you were at least full retirement age, you would get a spousal benefit worth half of his amount. If he got $2,000 a month and you’re 66, you would get $1,000 a month. Now spousal benefits, just like retirement benefits, are available earlier. I could collect them as early as 62, but I’m not going to get 50% of my husband’s benefit, because I’m collecting early. I’m only going to get 35% of my husband’s benefit. Now that’s pretty clear. Now, what happens if, like most women today, I also have my own retirement benefit on my own work record? Well, Social Security is not going to pay me two benefits. They’re going to pay me the higher of the two benefits. My own benefit or spousal benefits. So again, let’s go back to, my husband’s benefit is $2,000 a month. If I’m full retirement age, my spousal benefit is $1,000 a month. But let’s say my own benefit is $800 a month. If I wait till 66, I’m still getting that $1,000 – half of his. But technically, it’s $800 of mine plus being topped off by $200 of my spousal benefit, bringing the total up to $1,000 a month. Still pretty easy if I’m claiming at full retirement age. If I claim before full retirement age, that’s when it gets messy. My own benefit at 66 is not worth 100% of my benefit, it’s worth 75%. So let’s say, I don’t know, my benefit is worth $1,000 a month, I claim at 62, I’m only going to get $750. My spousal benefit, if I claim early, is not worth 50% on my husband’s. It’s worth 35% of my husband’s benefit. So again, they’re going to pay me the higher of the two amounts. Under the new Social Security claiming rules – it used to be if I waited until my full retirement age of 66 to claim for the first time. I could say to Social Security, “don’t pay me my benefits, let them keep growing by 8% a year. But in the meantime, now that I’ve reached my full retirement age, pay me only as a spouse. Pay me half of my husband’s benefits, pay me half of my wife’s benefits.” Well, those rules have now changed. The only people who can still do that are born on or before January 1st, 1954 – and they can do that when they turn 66. People like me, who are born after that date, will never have that option. Whenever we file for Social Security, we will be paid the highest benefit which we’re entitled at that age, whether on our own record or as a spouse. We don’t get to choose. Mary Beth Franklin is throwing a whole lot of facts and figures and information at us, so if tapping the skip backwards button and listening again isn’t cutting it for you, visit the show notes for today’s episode at YourMoneyYourWealth.com to read the transcript of the entire interview and catch up on those facts that have been flying past your ears. And if you’re getting value out of the podcast, mash that “share” button in the upper left of the show notes and blast it out on social media, email it to your friends, and spread the YMYW love. Make sure you’re subscribed to the podcast too so you don’t miss psychologist and asset manager, Dr. Daniel Crosby, returning soon to Your Money, Your Wealth, to talk about his book, The Behavioral Investor. In the meantime, more with the Goddess of Social Security, Mary Beth Franklin. Joe: So if my spousal benefit is $1,000 at full retirement age, and so my own benefit record, let’s say, if I claimed that at 62, is $800 So what you’re saying is that I can’t claim my own record at 62 and collect the $800, and then at full retirement age flip to the spousal, and get the thousand? MBF: Correct. What would happen is, if I’ve collected my own benefit first, my Social Security benefits are permanently reduced. So let’s say I collected my own benefits early. They’re reduced. My husband hasn’t claimed yet. So there is no spousal benefit to claim, it doesn’t exist. Once he claims, he’s now triggered a spousal benefit for me. And whatever that extra amount is, it’s added on top of my reduced benefit. So the combination is going to be worth less than half of his. Joe: Got it. Yes. OK. Because the spousal benefit can only be triggered if my spouse is claiming a benefit. So if I’m claiming my own benefit on my own record first, because my spouse has not claimed their Social Security benefit, and then when the spouse claims their benefit, and then let’s say I’m at full retirement age at that point or older, then it’s going to flip. I would still get the reduced amount on my own record. But then they’re going to give me half of the Social Security – but it’s still going to be reduced, but maybe not as much if the spousal benefit triggers on after full retirement age? MBF: Right. Let me give you an example. My full retirement age benefit is $1,000 a month. My husband’s full retirement age benefit is $2,400 a month. Half of that, in theory, the spousal benefit is $1,200 a month. The difference between the spousal benefit of $1,200 a month and my own $1,000 a month is $200. If I claim my own, and maybe say I get $600 a month, my husband hasn’t claimed, there is no spousal benefit. When he finally claims and assuming I’m at least full retirement age, they are going to add that differential, that $200 a month, to my permanently reduced benefit of $600 a month. Now I’m going to get $800 a month. I’m never going to get that $1,000 because I claimed early. Joe: Got it. You are the Goddess. Look at that. MBF: …and I’m at least full retirement age, my survivor benefit is going to be 100% of what he was getting. $2,400 a month. My smaller benefit goes away. So you can see, for married couples coordinating their claiming strategy, there really is no downside for that one spouse to claim early, even though her retirement benefits are permanently reduced. She will still step up to the survivor benefit if she is at least full retirement age at the time. So it’s a really good strategy for couples to coordinate their benefits. Joe: Speaking of death and survivor benefits. So let’s say that I was married and my spouse dies in my 50s. I could still claim on that deceased spouse’s benefit as long as I don’t remarry until after age 60? How does that thing work again? MBF: Correct. If you are a widow or widower, or for that matter, a surviving ex-spouse, which is someone who was married at least 10 years, divorced, currently single – you are entitled to collect benefits on your late spouse or your late ex-spouse, as long as you don’t remarry before age 60. You could remarry at age 60 and one day and still collect on that late spouse, even if you’re married to somebody else. MBF: Ah, there’s the rub. Joe: That’s the rub there because if I’m making more than I don’t know what, $17,000, $18,000, then it doesn’t really make sense. I’m not going to get anything anyway, or very little of it. MBF: Correct. And that’s why so many young widows and widowers are not collecting survivor benefits if they’re working. The rule is if you collect any type of Social Security benefit, whether retirement benefit on your own record, a spousal benefit on your living spouse’s record, or a survivor benefit on your late spouse’s record, you are subject to earnings restrictions if you continue to work. Now this is W-2 or 1099 income from a job. It is not investment income, pension income, anything else. This year, if you make more than $17,640 this year, you’re going to give some or all of your benefits back. When you reach your full retirement age, which right now is 66 for anyone born between 1943 and 1954, that earnings cap goes away once you reach 66. If you’re born after 1954, your full retirement age is a little higher. It could be 66 and two months all the way up to 67. Those earnings restrictions apply until you reach your full retirement age. So basically my rule is, if you plan to keep working, it does not make sense to collect Social Security benefits early. Joe: Now let me – you got my motors running here, Mary Beth. Joe: Yeah, yeah, I got goosebumps, I’m excited. That’s how pathetic my life is too, it’s like, man, I’m getting all excited about Social Security and I’m only 40. MBF: (laughs) Wait till we get to Medicare! But go ahead! Joe: All right, so now I am 60 and one day, I’m claiming my deceased spouse’s benefit, I am not working. I am remarried, and then let’s say my new wife dies. Do I get to pick then the higher of the two survivor benefits? MBF: Yes. Whenever you’re entitled to more than one benefit, you can only get one at a time, but you can always get the bigger benefit. MBF: (laughs) Oh he’s got a story I’m sure, Andi. Joe: You know, sometimes people fall down the stairs. MBF: (laughs) Joe is a terrible cook I hear. MBF: No, let me stop you right there. The phrase “file and suspend” – purge it from your vocabulary. It no longer exists. MBF: The last person who was able to file and suspend turned 66 and exercised that strategy by April 29, 2016. If they didn’t do it by that deadline, that strategy is gone. There is still one more available strategy, which is known as “filing a restricted claim for spousal benefits.” That means my husband or my wife is collecting Social Security, and when I reach my full retirement age, assuming I was born before January 1st, 1954, I can then say, “I want to file a restricted claim for spousal benefits.” That means, “don’t pay me my benefit. Let it keep growing by 8% a year. But in the meantime, pay me only as a spouse.” Now here’s the really important thing: 2019, this year, is the last year that people who turn 66 are eligible to do this. If you’re considering when and how to take your Social Security – or if you really just like having print versions of everything, you can learn the history of Social Security, how it works, and more on individual, spousal, ex-spouse, and survivor benefits, as well as how Social Security is taxed, and some advanced claiming strategies by downloading our free Social Security Handbook. Find the link to the Social Security Handbook, and plenty of other free Social Security resources, in the show notes for today’s podcast episode at YourMoneyYourWealth.com. Joe: So let’s say I claimed my benefit and I made a mistake. I listened to this podcast and said, wow, Mary Beth, she knows her stuff. I think I made a mistake. Can I suspend my benefit that I’ve already taken? MBF: Well, it depends. There are two answers to that. Anyone has the right, within 12 months of claiming any type of Social Security benefit, to change their mind and withdraw their application. They file Form 521, but there’s a catch – they have to pay back any benefits they have received, but it wipes the slate clean as if they have never claimed Social Security. So at a later date, when they are older and their benefits are worth more, they can start all over again. If they miss the 12-month window, they can no longer withdraw their benefits, but they can suspend them. But under the new rules, all these changes that took effect with the Bipartisan Budget Act of 2015, said yes you can still suspend benefits if you’re full retirement age or older. But under the new rules, if you suspend your benefits, you cannot collect benefits on anybody else’s record, and nobody can collect on your record during this suspension. So yes you can suspend it, so that now triggers these delayed retirement credits so your future benefit will be bigger, but the big catch is your wife can’t collect on your record, you can’t collect on her record during the suspension. Joe: Got it. And you have to be full retirement age for me to suspend. Joe: So if I’m full retirement age and said, “Oh, I never heard of these delayed retirement credits, I think that would be beneficial and I’m working part time. I don’t need the income. I have longevity. I’m going to suspend.” But if my wife was collecting me spousal benefit, that would stop her income from Social Security as well. MBF: Correct. The exception to that, and there’s always an exception – in fact, there are more than 2,700 rules that govern Social Security benefits. The exception is, if you suspend your benefits and you’re divorced, and your ex-wife is collecting on your record, the suspension will not stop her benefits. So you can’t suspend your benefits out of spite to try to hurt your ex-spouse. Joe: I had this email question I answered earlier, and I’m going to just verify my answer. (laughs) The individual was claiming Social Security disability benefits. And the question is, when she turned for retirement age, her disability benefits were going to go into her retirement benefit? MBF: That’s correct. Let’s back up and explain to your listeners a little bit about Social Security benefits. Social Security has three types of benefits: we think mainly of retirement benefits. It acts like a pension. Also, if you die and there’s a surviving spouse or minor child, there’s survivor benefits like life insurance. But then there are also these Social Security disability benefits if I become ill or injured and unable to work. Now, Social Security disability benefits are not automatic. They’re approved on a case-by-case basis, and frankly, are often very hard to get. But if you are approved for Social Security benefits, which usually occurs before your full retirement age, they don’t discount it, like giving you reduced early retirement benefits. Like if I applied for Social Security retirement at 62, they’re going to reduce my benefits compared to if I wait till 66. But if I’m injured at 60 and I’m approved for Social Security disability, they’re basically going to give me all the benefits I’ve earned up to that point. They’re not going to reduce them because I’ve applied early. They’re giving me a break because I’m disabled. But those disability benefits are paid out of the Social Security disability trust fund. So it’s an accounting thing. Once I reach full retirement age, I continue getting the exact same amount of money, but it’s now called retirement benefits because it’s paid out of the retirement trust fund. So once I get to retirement age, I’ve been on disability and collected for a few years, and maybe my finances are such that, “Gee, I don’t need the money right now. I wish it was bigger.” I could suspend my benefits at that point and let them grow by 8% a year up until age 70. I can’t do it before they convert to retirement benefits. I used to be able to do that before Social Security changed the rules – I think was back in 2010. They basically said, “hey, if you try to withdraw your disability benefits, we’re going to make you pay them back to the date you started disability.” It might have been 10 years. It might have been 15 years. That would be crazy. So basically, on disability, you let them automatically convert to retirement, and if at that point, you chose to suspend them to earn delayed retirement credits you could do that. Joe: So they could suspend the benefits, but they would have to convert to retirement benefits. But they would not be able to suspend and then file on a spouse if they were claiming. MBF: Correct because under the new rules, once you suspend benefits, and you have to wait to your full retirement age to suspend benefits, you cannot collect on anyone else’s record and they cannot collect on you. Joe: So I answered the question right, but just not with as clear, concise details. Joe: Yeah, because he was thinking about filing and suspending – nope, you just can’t do that. MBF: I mean they could have done that in the past, but once they changed the rules as a result of that legislation in 2015, all the rules changed. MBF: …and state employees who do not pay FICA taxes, and they have a whole different set of rules that apply to them. Joe: A lot of times people will come in and then they are not putting into Social Security or something’s going on, and then they’re subject to the GPO or the WEP. MBF: Yep, let me explain. There are two different rules. Here’s the bottom line. Social Security is “you must pay to play.” If you’re in a job, which is generally a public sector job, at either the federal, state or local government, this does not affect military – military pay into the payroll taxes, FICA taxes. But if you’re in a career where you don’t pay payroll taxes, then you’re not going to get a Social Security benefit. But many people who are in those public sector jobs also work long enough in the private sector – meaning at least 10 years – that they’re eligible for a Social Security benefit. But when they get their personalized Social Security benefits estimate, which everyone should be getting by logging on to SSA.gov and setting up my personal account so they can get this information, your benefits statement like might say, “hey Joe, you’re getting $1,000 a month!” Don’t believe it, because if you did not pay payroll taxes for a certain amount of time, and you’re entitled to Social Security benefit on your own record, you’re going to get a benefit, but it will be reduced by something called the Windfall Elimination Provision – WEP. Think W: worker, windfall. If you have a Social Security benefit of your own and you have a public pension where you didn’t pay FICA taxes, you’ll get a benefit, but it will be reduced. Now, let’s say you’re a California schoolteacher, never paid FICA taxes, but you’re married to somebody who works in the private sector. You might think, “well, I don’t get it Social Security benefit, but I’ll get one as a spouse.” Probably not, because you’re subject to an even more onerous rule, called Government Pension Offset, GPO. What some people refer to as Grumpy Partner. It says, if you have a public pension based on work where you didn’t pay FICA taxes and you try to collect Social Security as a spouse or survivor, we’re going to reduce your potential Social Security benefit by two-thirds of the amount of your pension with no dollar limit. So if your pension is $3,000 a month, two-thirds of that is $2,000 a month. We’ll subtract that from any potential Social Security benefit, which is going to wipe out any spousal benefit and significantly reduce or eliminate a survivor benefit. So my bottom line for married couples where one spouse is a public sector employee who’s not entitled to Social Security, maybe that couple does not want to delay their benefits because the person in the private sector – the whole reason you want to delay your benefit until it’s worth more later is knowing that your surviving spouse might get a bigger survivor benefit. If your spouse isn’t entitled to a survivor benefit, maybe you want to collect Social Security at 66 and enjoy the money. Joe: Wow, my IQ just raised quite a bit, Mary Beth. Andi: A goddess and an encyclopedia. Joe: Man, you are the best. I really appreciate your time, I know you’re super busy, and coming on short notice – it’s a true pleasure having you. Joe: (laughs) There you go. Andi: (laughs) That is romantic! Joe: Yes. I love it. That’s Mary Beth Franklin. That’s it for us today folks, we’ll see you next week. Special thanks to today’s guest, InvestmentNews Contributing Editor and the “Goddess of Social Security” Mary Beth Franklin. 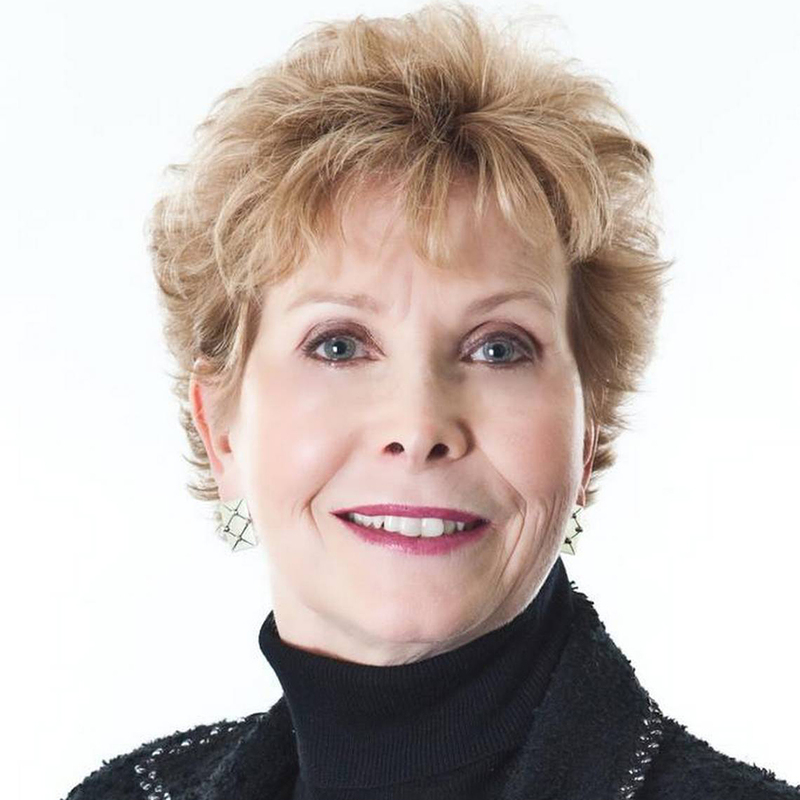 Find links to Mary Beth’s latest articles in the show notes at YourMoneyYourWealth.com.